Spring has taken off in a big way and crops have responded in kind. As the winter crops shed their winter coats, they are beginning to change colour in response to fertiliser application and growth regulation is now imminent in most situations. As crops move from the tillering stage to stem extension stage, the technical term used is Growth Stage 30, which is reached when the developing ear is 1cm long. At this stage, the developing ear is still buried deep inside the plant, and has to be carefully dissected to avoid butchering the plant altogether in the search. But if you look carefully, you might get a sneak preview of the developing future grain crop. At this stage of a crop, the maximum number of plants have been reached, the maximum number of tillers per plant has been reached and the maximum number of potential grains per plants has have also been reached. It’s not even April, but from now on crop production is a salvage operation to try and protect as much of that potential yield as possible. When you consider this fact, the main split of nitrogen which has yet to be applied, all of the fungicides have also yet to be applied, even micronutrients that are still in the can , are not about yield increasing, they are about protecting what is there. The only way to affect grain yield from now on is to maximise grain fill, ie maximise the weight of each grain. If every square metre is filled with grain and every grain is filled to its maximum potential, only then can we say that we are growing crops to their maximum potential. When you do the sums on winter wheat for instance, the gap between potential yield and actual yields achieved is indeed quite sobering. To get standard target figures for winter wheat, 250 plants/m2 with 2.5 tillers per plant equals 625 plants/m2. With 45 grains per ear the total grains equal 28,000 grains /m2. Set a weight of 54 grammes per thousand grains (known as thousand grain weight) and the calculator says 15t/ha, or six tonnes per acre. These are average figures but they demonstrate that winter wheat as a crop has the potential to deliver very high yields. Unfortunately, we are not capable of reaching these figures, not on an average across a field and definitely not on a year in year out basis. In the early 1980s, one of the big chemical companies of the day, Ciba Geigy, a name since consigned to history, launched a campaign called ‘The Ten Tonne Club’. 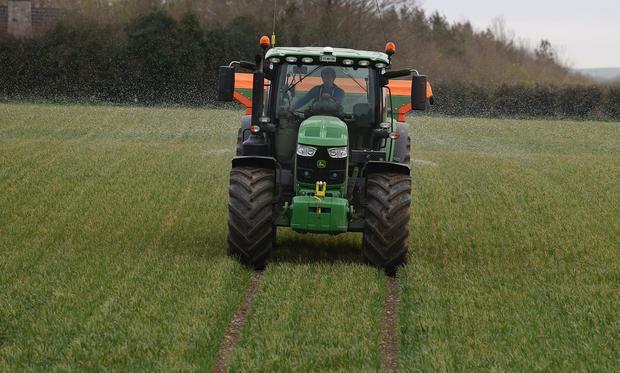 This campaign challenged specialist winter wheat growers to aim for 10 tonnes per hectare or four tonnes per acre of winter wheat. Forty years later, and unfortunately 10 t/ha is still a target which we can still find hard to reach across a big acreage of our land, even in a good year. Sonner or later, we will have to address why there is such discrepancy, and why this discrepancy between what the potential of our crops are and what we are actually selling and getting paid for them is ever increasing. If prices could be increased by 50pc but weren’t, quite rightly there would be a hue and cry, but that is the potential that we are losing on our crops every year, and there isn’t a word about it. Why are we not reaching this potential? It’s not down to some super-duper fungicide that we can’t get our hands on or a fancy computer controlled GPS machine we need grant aid to get. For answers we need to start looking at the boring basics: soil fertility, soil pH levels, soil compaction, good rotations, organic manure application and reducing the weight of machinery that we are putting on our land. We need to make our soils healthy again. So as we take to the fields to protect these minuscule ‘bumps’ still in the centre of the tiny plants, bumps that ultimately are what are run across the weighbridge to pay all the bills, keep a good eye out on what is impeding their potential. You mightn’t be able to make many changes for this year, but it is never too early to begin planning for the future.